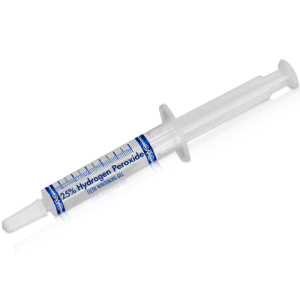 If you did your teeth whitening research, you know that hydrogen peroxide is much faster-acting than carbamide peroxide. So if you do chair-side whitening treatments, we highly recommend that you use hydrogen peroxide teeth whitening gel in order to achieve dramatic results quickly. We recommend our paint-on method when using hydrogen peroxide gel because it is much too strong to use in mouth trays where it would get on the gums. With the paint-on method, the gel is carefully applied directly to the teeth, avoiding the gums completely. Soft tissue is kept away from the teeth with the aid of a cheek retractor. 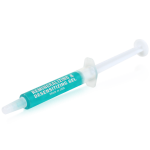 The Advanced Whitening Kit is an example of a kit that utilizes this method. 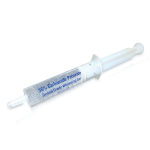 For home teeth whitening products, we recommend carbamide peroxide gel. 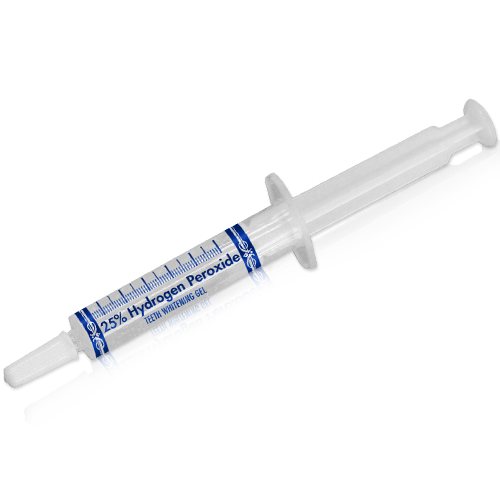 Beaming White stocks hydrogen peroxide gel in 6%, 16%, 25%, and 38%. 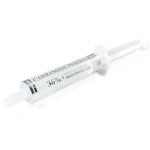 We offer most concentrations in a single, pre-mixed syringe. 38% HP is available as a mixing system only. We can make any other concentration you need from 3 percent to 38 percent. Our hydrogen peroxide bleaching gel is guaranteed to last at least 1 year in refrigeration and is made in the USA in our own production facility. Note: Some countries, such as the European Union, limit the use of hydrogen peroxide in teeth whitening products. 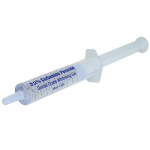 We developed two types of non-peroxide teeth whitening gel for use in such countries.